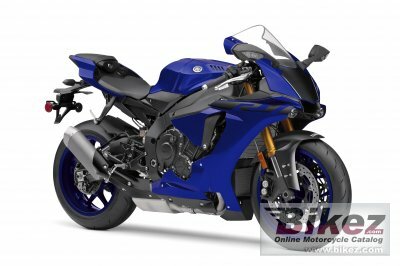 2018 Yamaha YZF-R1. Picture credits - Yamaha. Submit more pictures. Featuring titanium fracture-split connecting rods, an offset cylinder block and magnesium covers, the motor delivers extremely high horsepower and a strong pulse of linear torque for outstanding performance, all wrapped in aerodynamic MotoGP�-style bodywork. Price as new (MSRP): US$ 16699. Prices depend on country, taxes, accessories, etc. Seat height: 856 mm (33.7 inches) If adjustable, lowest setting. Comments: Traction Control, Slide Control, Wheel Lift Control, Quickshifter, Launch Control, ABS, Unified Braking System. Ask questions Join the 18 Yamaha YZF-R1 discussion group or the general Yamaha discussion group. Bikez has discussion forums for every bike. View comments, questions and answers at the 2018 Yamaha YZF-R1 discussion group. You can sign up for e-mail notifications when other riders answer you. If you have extensive experience with the MC, please send us a review. If you consider buying this bike, you should view the list of related motorbikes Look at photos. Compare technical specs. And check out the rating of the bike's engine performance, reliability, repair costs, etc. You can compare the rating with other bikes.